Shea Witsett of The Prayer Wheel Shop poses by a Prayer Wheel in Kham. BW: How did you get started in making custom Prayer Wheels? 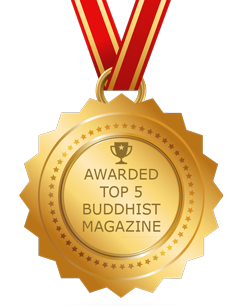 Shea: I lived at a Tibetan Buddhist retreat center in Arizona, the Garchen Buddhist Institute, for many years practicing under the instruction of my teacher H.E. Garchen Rinpoche. He is a serious prayer wheel practitioner and advocate who is almost never seen without his prayer wheel spinning. Being a wood worker I was inspired to make a couple prayer wheels at one point. When people saw them they just started asking me to make a prayer wheel for them. I did it for free at first, but after a year or two it got to the point where I had to quit my job to keep up with the demand. My teacher encouraged me, as it’s a good way to benefit sentient beings and practice right livelihood. So I sort of organically became a prayer wheel maker. A hand-crafted wheel made by Shea at The Prayer Wheel Shop. Inside are millions of mantras on microfilm. BW: Is there a lot of demand for custom Prayer Wheels? Shea: People order them from over 20 countries and we now have three people working at the Prayer Wheel Shop. So I would say it’s not a big industry or anything, but there seems to be more and more interest in Tibetan Buddhist practices worldwide, including prayer wheels. It’s really encouraging to see an increase in the amount of people who want to practice loving kindness and compassion and to get to interact with them every day. 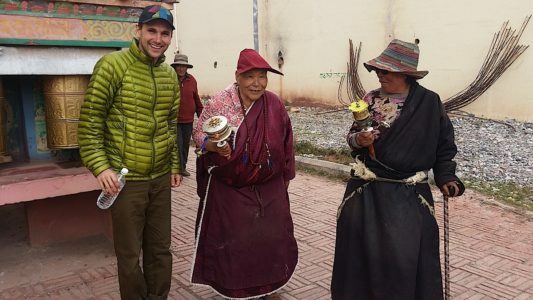 Unfortunately, there’s still a lot less demand for prayer wheels than there is for guns and weapons, so there’s hopefully plenty of room for growth. 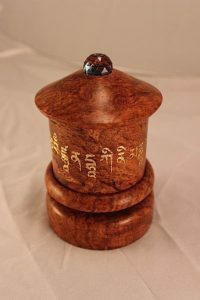 BW: Why do you create prayer wheels with a custom choice of many different mantras, not just the Om Mani Padme Hum traditionally used in wheels? Shea: We mostly use the Mani mantra with a little bit of the Green Tara mantras in all our prayer wheels unless people specifically request something else. My teacher H.E. Garchen Rinpoche likes the Mani mantra with just a little bit of Green Tara mantras added, so that’s what I’ve always used. People have different karmic connections to different practices and I’ve been advised by a few well regarded Buddhist teachers that it’s fine to make prayer wheels with different mantras to accommodate their requests. I will also add that my teacher H.E. Garchen Rinpoche has always pointed out to me that all the mantras have the same essence, so they are really all contained within the Mani mantra. 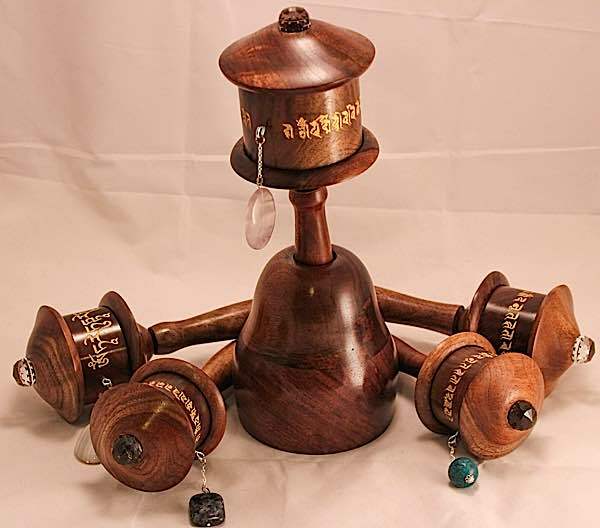 Modern-day prayer wheels include more mantras (thanks to microfilm) and smoother spinning action (making it easier to spin “all day long.”) These hand made wheels are from Prayer Wheel Shop, made by Shea Witsett. BW: You use Microfilm instead of paper to allow many more mantras to be used. How is it created? Is that recommended by teachers? Clearly legible microfilm is the secret behind fitting large numbers of mantras inside a prayer wheel. Today, even large temple wheels are made with microfilm. Shea: A prayer wheel is said to be of more benefit the more mantras it contains, so the microfilm was developed based on that idea. The microfilm is exactly what it sounds like, rolls of film, like they would shoot old movies on. Every frame is a full printed page of very small font mantras. They’re only visible under a microscope, but are printed perfectly clearly. This is one of the only mediums that the mantra can be clearly printed at such a tiny size. This is important, because you need to make sure that a mantra is both clearly written and oriented in the correct direction inside of a prayer wheel. So the microfilm is the ideal way to fit millions of tiny perfectly copied mantras inside a prayer wheel. It is also used to fill statues and stupas these days. An imaging company here in Portland, Oregon produces the film for us. 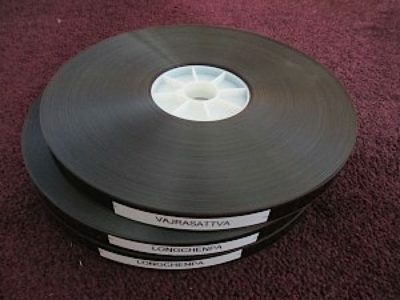 The microfilm operation was initially setup up by the FPMT organization and has been an ongoing collaborative project between the FPMT, myself and several other Buddhist organizations. One of the custom prayer wheels with mantras customized to the practitioner. BW: You follow traditional Tibetan Buddhist guidelines? A table-top prayer wheel tends to be more convenient and contains more mantras. Shea: Yes. It’s interesting because different lineages and teachers will have slightly different traditions. It’s not like there’s only one tradition. But generally they have a lot of common ground. I follow a combination of the advice of my teacher H.E. Garchen Rinpoche, whose lineage likely goes back all the way to the first appearance of prayer wheels in Tibet, and Lama Zopa Rinpoche, who has made a lot of really great teachings and resources available about these traditions. 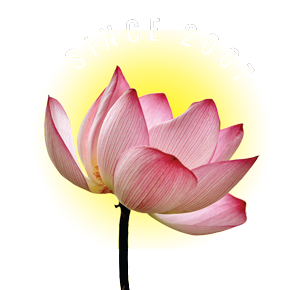 BW: Have you made wheels for Buddhist teachers? If so, which ones? 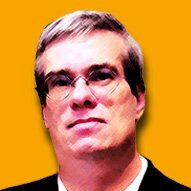 Shea: That’s a funny question. I’ve made prayer wheels for all the most famous Lamas;) Hahaha. I guess to give a serious answer, i’ve made prayer wheels for many well-known Buddhist teachers, but there’s no need to list them here. I’m really just happy when I get to make prayer wheels for sincere Dharma practitioners, no matter who they are. BW: I noticed that you use green renewable power sources and non-toxic finishes. Why is that important to you? 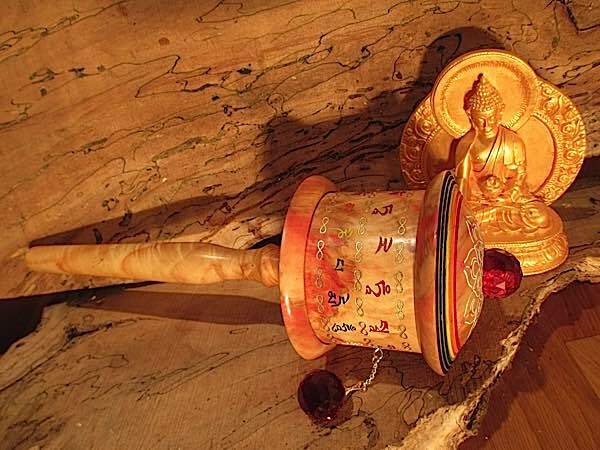 One of the author’s custom made prayer wheels, this one with Vajrayogini mantras, created by Shea Witsett at The Prayer Wheel Shop. Shea: Buddhist practice and right livelihood is all about Boddhichitta. It’s my goal as a Buddhist business owner to make every decision in the prayer wheel production based on Boddhichitta as much as possible. I think Buddhist businesses or organizations need to be examples of these types of principals. Choosing to pay more for renewable electricity and not using tropical hardwoods that contribute to global warming are just two examples of that. It’s really about being aware of interdependence and how simple choices can affect others. 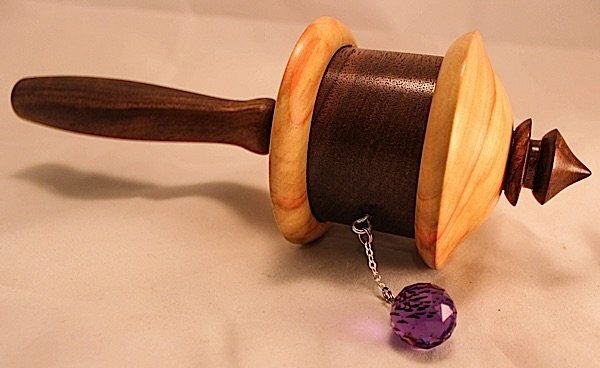 Making sacred objects for spiritual practitioners adds a little more responsibility to that. 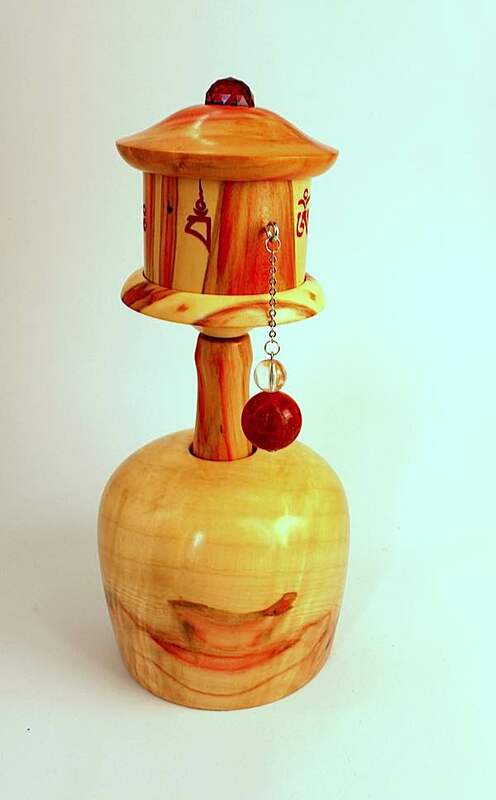 After all, if you make a prayer wheel with wood that was clear cut from a tropical forest by slave labor, using coal generated electricity and then cover it in a toxic chemical finish, it’s not exactly a holy object is it? BW: Can you share any fun or interesting prayer wheel stories? 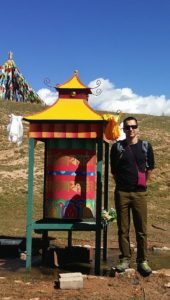 Shea: I went to visit one of my teachers a few years ago in Nangchen, Tibet. I was really blown away to see just how engrained the spinning of prayer wheels is into the culture there. There is a long row of big prayer wheels in almost every tiny village you drive thru, and there is almost always someone out spinning them. I was really impressed and I think it really deepened my appreciation of the importance of prayer wheels in the cultural heritage of Tibet. For anyone who likes prayer wheels, it’s really a great experience to go to Tibet. Shea visited Yachen Gar, a nunnery housing over 10,000 Buddhist nuns, before the Chinese government began mass evictions. Here, a few Nuns admire a prayer wheel She brought along. Here in the west when I meet someone new and I get the inevitable “so what do you do?” question, it leads to an often hilarious exchange of me trying futilely to explain what prayer wheels are to skeptical strangers. When I was in Tibet and I told people I made prayer wheels, they would often get pretty excited and ask me all sorts of questions about how many people in America spin prayer wheels and then they would bring out some cool metal prayer wheels from their house to show me. They would always want to try my wooden prayer wheel and hand me theirs to try. Sometimes it was pretty hard to get mine back when it was time to go. My prayer wheel never made it back from that trip to Tibet!